Nigeria’s biggest and most respected music awards, The Headies is back for the seventh year! Organizers of Hip Hop World Awards which debuted in 2006 this week announced “A countdown to the big day”- which officially kicks off THE HEADIES. “On July 23, we will have a mini event to give out the car and plaques to last year’s winners, and then the following day, we will officially launch the countdown to the big day by announcing nominees, hosts, sponsors and other plans” Ayo Animashaun says. A total of 23 Plaques will be given to last year’s winners- 2face, Don Jazzy, Darey, Ice Prince, MI, Waje, DJ Tee, Modenine, Cabo Snoop, eLDee, Femi, Dr. Sid, Jah Bless and WizKid with Wizkid leaving with the biggest prize- a brand new Hyundai Sonata 2011. 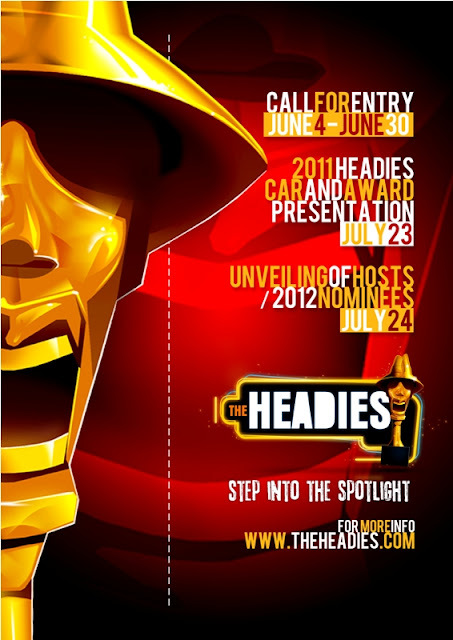 Though yet to make the date of The Headies public, Hip Hop World Awards is already dangling a new theme “step into the spotlight” before rising and established Nigerian acts whose materials – released between March 2011 and February 2012 – pass the test.